This is a book that I've been wanting to read since I first heard about it. Like just about everyone else, I've read The Diary of a Young Girl by Anne Frank. However, I read it once in middle school and not since--it just symbolizes something so tragic to me that I couldn't bring myself to read it again. Perhaps why that is why I was drawn to Margot--it presents a slightly less tragic outcome. When dealing with an Alternate Historical Fiction, it is sort of strange to talk about the accuracy of the book. That being said, I think--had things happened as Cantor tells it--this would have been a very accurate portrayal of Margot Frank's life. There are a number of layers to her experience, all of which are well recounted by Cantor. First of all, she is very clearly suffering from Post-Traumatic Stress Disorder. 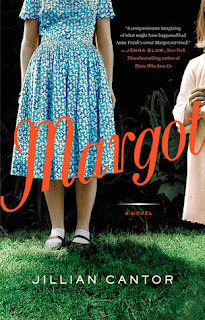 Tied in with this is Margot's dealing with her own Jewishness--while Philadelphia of the late 1950's is nothing compared to Nazi Germany, there was still discrimination and violence against Jews, especially immigrant Jews. Margot also deals with a great deal of survivor's guilt, which like the PTSD would be expected. Now, add in the fact that her sister is Anne Frank--the girl everyone is talking about. The film of her diary has just been released and everywhere Margot looks, she sees the "Anne Frank" of the American eyes, which does not always match up with the Anne Frank she knew and loved. I truly enjoyed this book and had trouble putting it down. It isn't a wholly perfect book. For one thing, it almost reads like a Young Adult novel. Of course, there is nothing wrong with YA Fiction--I find myself reading and enjoying it quite often lately--but because of this is created a little disconnect. This story is not a YA story, but it felt like it had a YA heroine stuck in a book for adults. I also had one little gripe about Cantor's premise of Margot surviving. She never explains why, if Margot survived, she showed up as dying at Bergen-Belsen in the Red Cross lists (something she also references in the book). The Frank sisters were put on that list by a fellow prisoner, Janny Brandes-Brillesljiper, who was serving as a nurse to the sick prisoners and who buried Anne and Margot together in a mass grave. If things happen as Cantor explains, Janny would not have buried Margot and, therefore, would not have added her to the Red Cross lists. Still, even with these minor quibbles, I found myself taken in and captivated by Margot Frank, this young woman who seems to have been lost in the shadow of her younger sister. I would heartily recommend this book to anyone with an interest in Historical (Real or Alternate!) Fiction. I received a copy of this book through the GoodReads First Reads program. I was encouraged, but not requested, to write an honest review. I received no other compensation for this post. I love historically based fiction, even if the author took some liberties it sounds like a great read! I have had this on my to-read list for a while. Now it looks like it's time to move it to the top. Even with the minor issues you had with it, it sounds like a really good read. Oh my God, it looks so good! Want it!